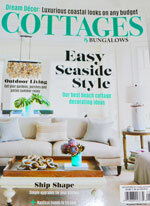 delightful blog -http://lumnroe.blogspot.com/ - Tattered Hydrangeas. 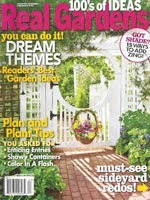 With the down turn in our economy and high rate of unemployment in our country, my sister Leslie and I thought it would be fun for us to share with you some of our "thrifty" ideas for Mothers Day gifts from our gardens for under $5.00 Let's take a little tour and see what we have been up to. Looks like Bentley is ready to take us on a little tour. First we need to gather the ingredients for the thrifty gifts. 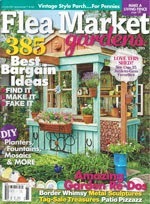 Your local grocery stores and farmers markets are great sources for inexpensive flowers and plants. Next we need to find some charming and inexpensive containers. You can easily find containers at garage sales, the local 99. Cent Store or flea markets. You will also need a few buttons, ribbons , and scrapping papers. Nine seed packets found for .99 cents at the 99 Cent Store. Flower pot and saucer purchased at garage sale for $1.00. With the addition of the 9 seed packets this makes a great gift for a gardener. 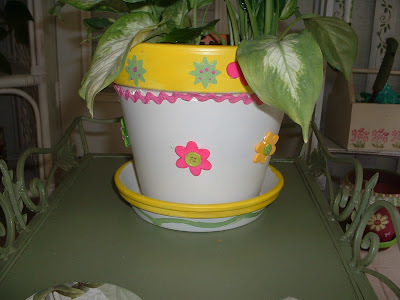 . . place the seed packets in the flower pot and place the saucer on top of the flower pot . . .this makes an adorable container for the seed packets . . next tie with a bow and you have a charming gift for under $5.00. 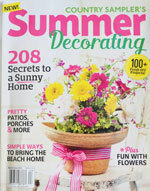 Leslie, purchased terra cotta flower pots and saucers from Michael's with a coupon. 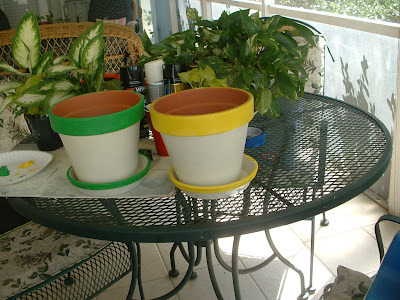 First she spray painted the pots - turn pots upside down so you don't get paint on the inside. Spray both sides of the saucer. Now for the fun part. 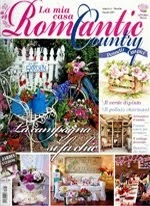 Decorate using lace, ribbon, scrapbook paper, buttons, etc. and attach with a glue gun. 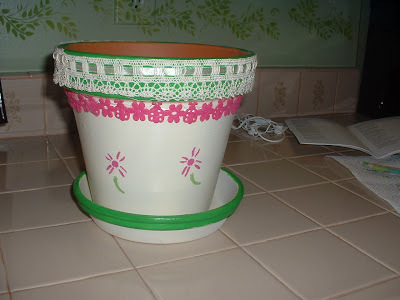 If you use scrapbook paper, it is best to attach it to the pots with modge podge and cover it with another coat of the modge podge (a foam brush works great). You can also decorate with stencils and paint a little squiggle on the saucer. Best to seal the pots before planting them. They are darling on a porch or inside the house - they will not hold up well outside for a long time as the paper will not hold up in rain or in bad weather. Next plant your charming little pots with an inexpensive plant purchased from your grocery store or farmers market and you have a wonderful gift for under $5.00. 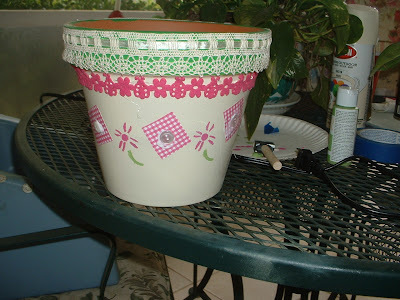 The pots are so easy and great fun to make with your children and grandchildren. Tiny pots and plants purchased at the .99 Cent Store for a total $2.00 make the perfect little gift. Looks like Bentley found another little gift to show you. 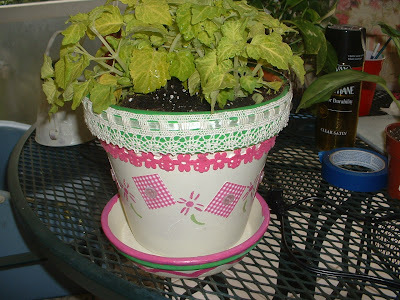 A darling green watering can purchased at the .99 Cent Store filled with daisies makes a very special little gift for a gardener to use in the garden after the flowers are gone . . cost - less than $2.00. Looks like Bentley has another little gift to show you. A sunny yellow tea pot and cup purchased for $2.98 at a garage sale makes an adorable container for flowers - this is a wonderful little gift for a tea drinker. Wishing everyone a Blessed and Happy Mother's Day.
" All that I am or ever hope to be, I owe to my angel Mother" Abraham Lincoln. I love hearing from you. Thank you for visiting and for taking time to leave me comments and e-mails and for following my blog. 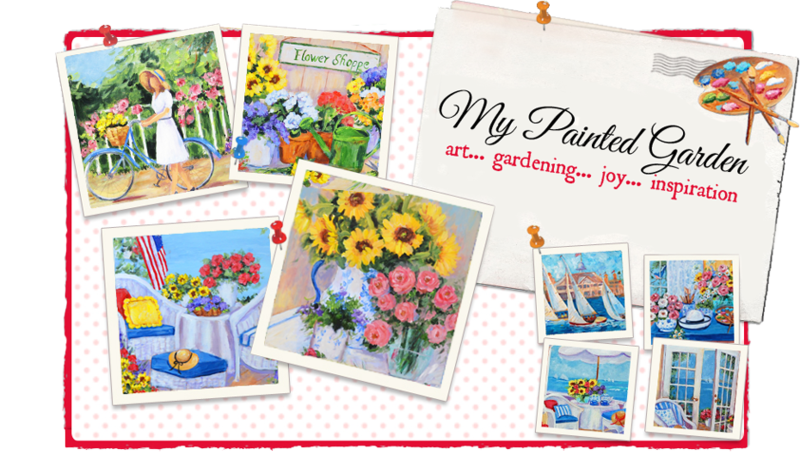 If you have any questions or would like to see me paint something special, please leave me a comment or send me an e-mail. Have a lovely week. Thank you for the adorable ideas. Wow - you and your sister are certainly a creative pair - what fun you must have had growing up together. How cute can you get - I love visiting your blog - everything is always so happy and pretty - yet you give us such great information. Love - love - love it. I had to look it up myself!!! I will e-mail you my address and thank you so much!!! Erin, you've got some lovely, simple and very elegant mother's day gift ideas here...just goes to show you don't have to spend a million dollars to come up with something beautiful. Thank you so much for the pretty and thrifty ideas - times are very tight for us and you gave me lots of beautiful inspirations. You are so lovely and your work beautiful. Wonderful ideas! And congrats to the winner of the sweet sign! I know she is thrilled! Beautiful ideas, Erin! I especially love the garden flower pot with the seed packets. You and your sister are very creative. I love love love those decorated pots. What mom wouldn't enjoy receiving something that cute! 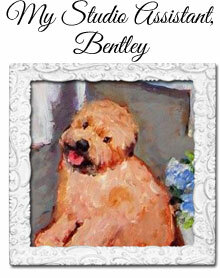 Although I'd choose Bentley as my gift for sure! Erin: Got my giftcard and my welcome canvas and I LOVE them! My canvas is out on my porch, it is covered so I think it will be "safe". And I can't wait to go shopping with my gift card! I am going to take some photos this weekend and post them up so you can see it in its new home! !